SKU: JR-7475. Availability: In stock Categories: Kitchen Utensils, Kitchen Accessories, Pizza Tools, Dredgers / Shakers. Tag: dredge-dredger-shaker. 8oz. 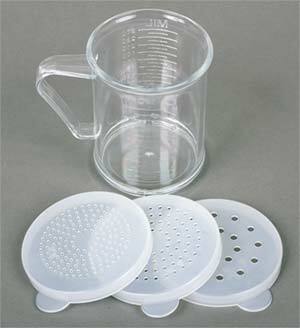 acrylic dredger/measuring cup with handle . Has graduated milliliters&ounces. 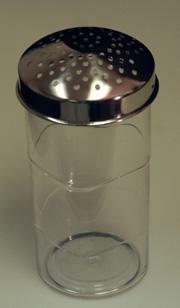 Comes with 3 interchangeable shaker lids in fine, medium and large holes.